Here in Northern Michigan we are desperate to enjoy every bit of sunlight and want to make the absolute most of our outdoor spaces. We enjoy the spring, summer and sometimes fall months with the sizzle of our outdoor grills. However, the typical backyard these days doesn’t just incorporate a barbecue grill and a seating vignette, now it offers an all-encompassing living area designed to have the same amenities as interior spaces. More and more, outdoor areas include a fully-functional outdoor kitchen, fireplaces or fire pits, cozy seating, advanced lighting and heating systems, and so much more. The kitchen remains the focal point of casual entertaining, only today the kitchen has moved outdoors. 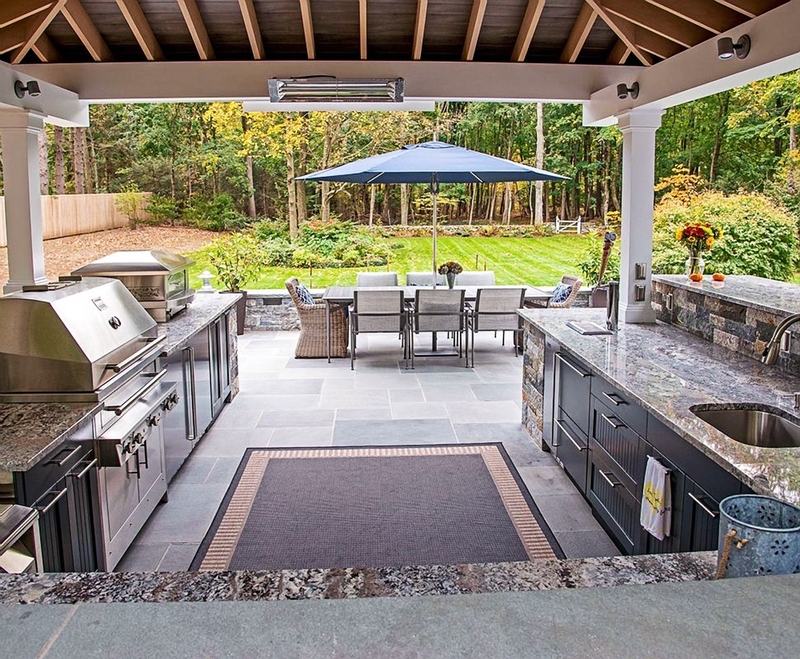 Having an outdoor kitchen makes life easier for those who enjoy grilling their meals and entertaining outdoors, making your backyard patio an extension of your family’s living space. 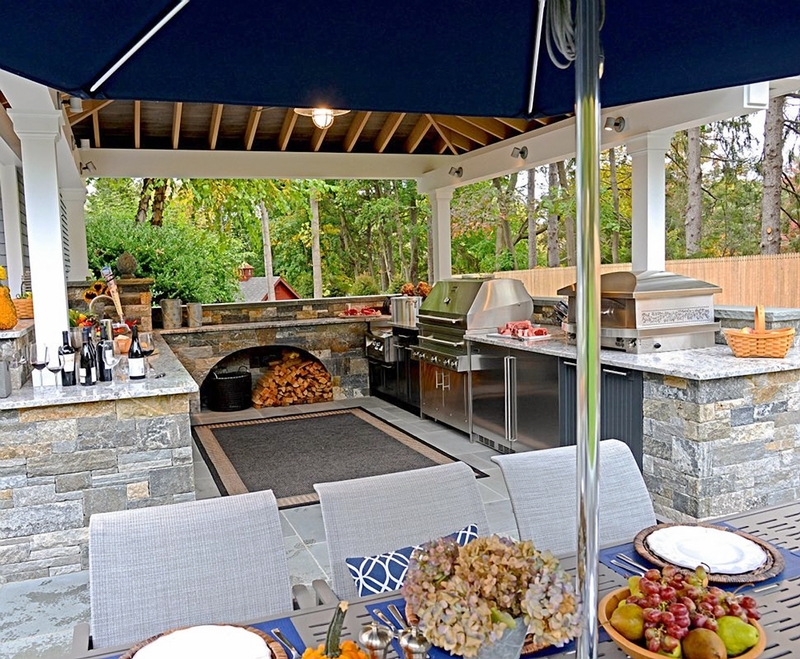 The popularity of outdoor living has homeowners focused on the color, style and design of the whole entertaining space, rather than a traditional stone barbecue island where guests watch the host cook. As these traditional backyard patios evolve into luxurious outdoor living spaces, Brown Jordan Outdoor Kitchens leads the way. The Quiet Moose collaborates with them because there is nothing that can’t be done – literally. With almost 400 choices in cabinet sizes we can accommodate almost any kitchen layout or challenging footprint. We consider every project to be our most important – no matter how large or small. Our designers will work with you throughout the entire process to bring your custom outdoor kitchen to life from the initial design to installation. Outdoor living is about more than just personal style and atmosphere; it’s also about function and longevity. 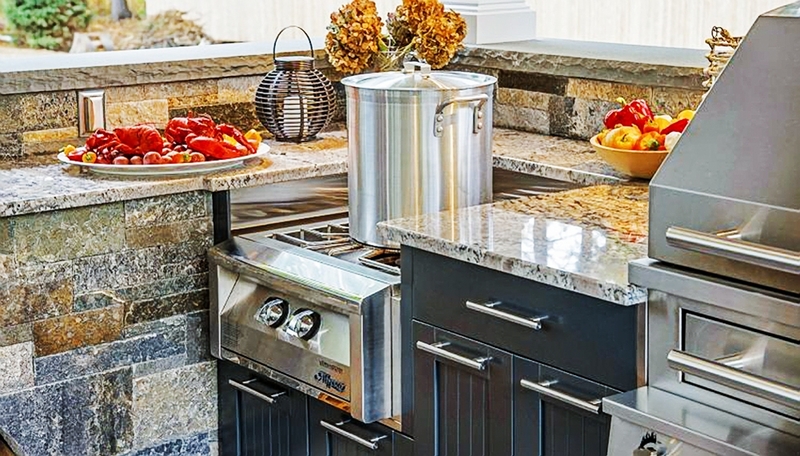 Brown Jordan Outdoor Kitchens stainless steel cabinets are specially designed and engineered for outdoor kitchens and other spaces where durability is a concern. It is the perfect choice for beauty, style, color, and durability, as well as the optimal investment in outdoor living projects. You have all the convenience and all the accessibility of your indoor kitchen but its completely weatherproof and virtually indestructible. However you imagine your outdoor entertainment space, we can help it truly become an extension of the home. 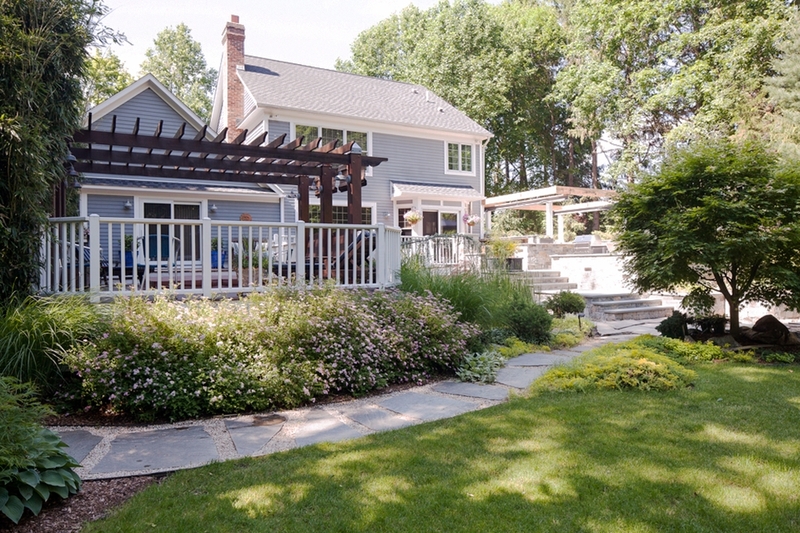 Today, more people than ever are taking advantage of backyard outdoor living, bringing their culinary skills and entertainment needs along with them. The kitchen is a place where people gather in the home and now, it has moved outdoors as a fully developed, outfitted extension of the home, complete with durable, stylish cabinetry and the latest outdoor appliances. The upscale kitchen amenities you would find inside the home are now shifting to outdoor kitchens. We know how to help customize the outdoor living space precisely as you want it, down to the countertops and drawer pulls. 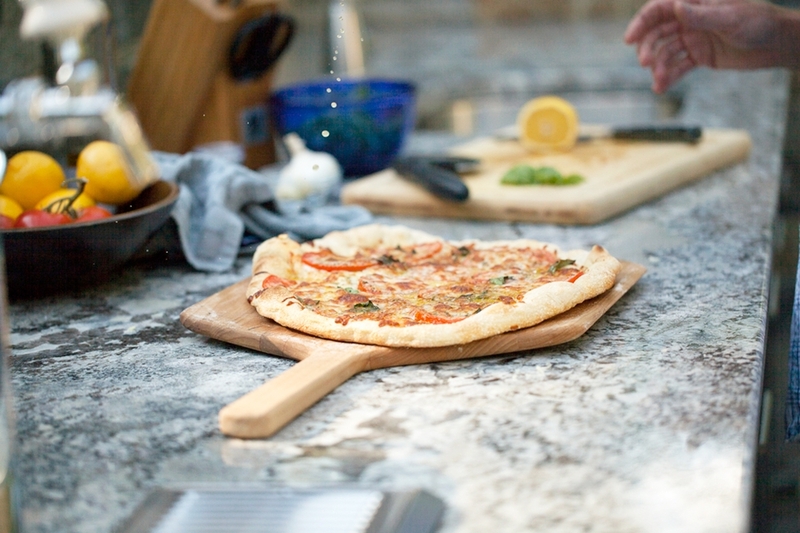 From pizza ovens and grills to refrigeration and bartending, there are countless options for customizing the outdoor kitchen, catering to cooking style and entertainment needs. Investing in the beauty and function of an outdoor entertainment space provides exceptional value to your property and more enjoyment for family and friends without ever leaving the home. The two elements that bring together a kitchen, indoors or outdoors, are the cabinets and the countertops. These elements need to hold up against time and climate, but also have the right look and feel to complement your landscape. We can accommodate nearly any type of countertop you want in your space, but not every countertop is built for outdoor environments. While granite, concrete, and soapstone are familiar countertop materials, it’s important to remember to use the correct material for outdoor applications; one that remains structurally sound and maintains its beauty over time. We can provide an endless variety of styling options to fit your creative needs. One of the great features of Brown Jordan Outdoor Kitchens is that their cabinetry is designed to fit any cooking appliance. 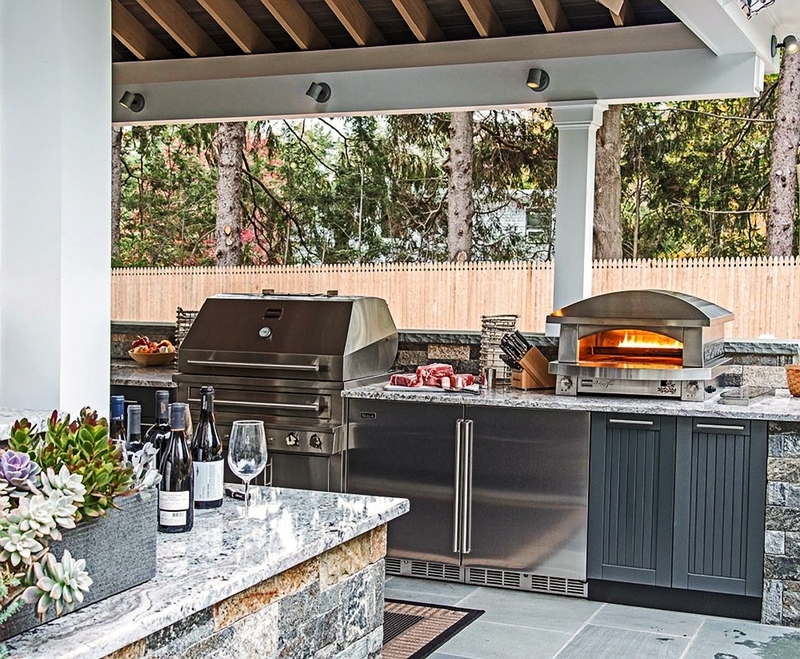 Whether you have a favorite grill, smoker, side burner or even a pizza oven, rest assured your selection can be incorporated into your new outdoor kitchen with ease. We can help guide you to a number of quality brands at various price points. 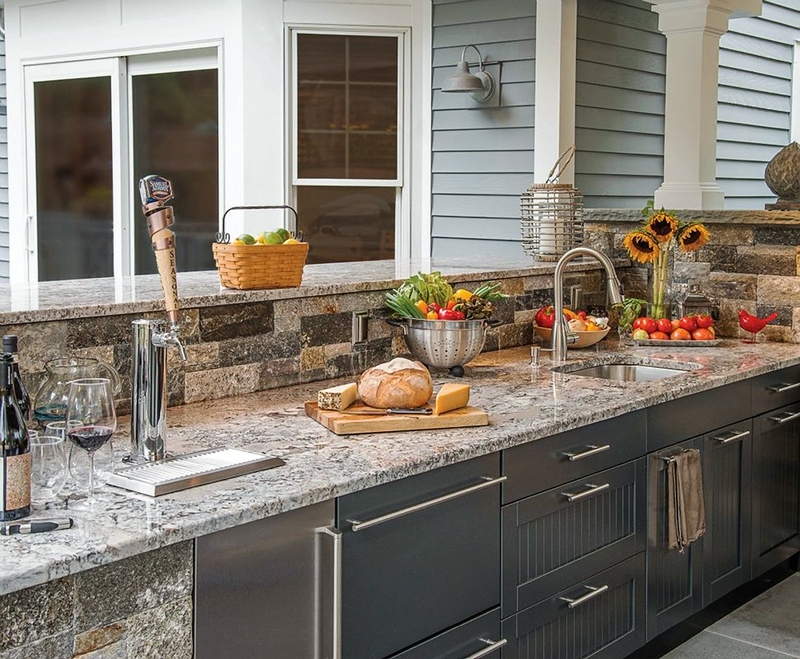 The convenience of a refrigerator integrated into your outdoor kitchen is a must, regardless of climate. Models and brands perform at different levels of effectiveness, based on the surrounding environment. There are also a variety of styles and features available to suit your taste and needs, including two-drawer units, glass fronts and those that can match your Brown Jordan Outdoor Kitchens’ cabinets. We can guide your decision on brand, features, and style. Bartending systems are among the most popular features in today’s outdoor entertainment spaces. Whether you want to add a kegerator, a wine cooler or a complete bartending outfit, we can help complete the project with several options, including sinks and faucets. After one conversation with one of our designers, you’ll realize that we are dedicated to engaging in a relationship with each of our clients. We are here to answer your questions to provide an outdoor cooking area customized especially for you. We can work with your builder, contractor, architect or yourself to complete the project. By entrusting The Quiet Moose to design and deliver a unique signature kitchen, you are insured to receive the maximum enjoyment in your outdoor living room!